Your special someone popped the question and you have the engagement ring of your dreams! What comes next? Now, it’s time to show it off — and whether you’re staging your perfect Instagram photoshoot to announce your new relationship status or just getting ready to show the ring to friends and family in person, you’re going to want to look your best. The easiest way to showcase your engagement ring is to complement it with the perfect manicure. No matter the style or season, here are some recommendations for the best nail colors and styles to show off your engagement ring. Get the engagement ring mani of your dreams! Solitaire engagement rings are all about the elegance and eye-catching glamour of the center stone, unencumbered by other stones or distractions. The solitaire engagement ring is so simple in its appeal, giving you room to be a bit flashier when it comes to your nails. If you want to gussy up your manicure with some nail art (maybe even one that calls attention to your engagement), go for it. Because your ring isn’t overloaded with bling, you can certainly up the wow factor on your nails, whether you go with rhinestones or other sparkles attached to your nails using the new nail jewel trend or whether you opt for something more understated like a sparkle gel polish or accent. With a solitaire diamond ring, the sky’s the limit because your ring will be the centerpiece of simple elegance and you can gussy it up with whatever extra sparkle or flashy color you might like. Maybe your ring has a lot of bling — think a halo setting with a diamond-encrusted band or a massive central stone with flashy side stones. In that case, you want your nails to be an understated backdrop to the seriously flashy new piece of your hardware you’re sporting on your left hand. Go for something elegant and understated like a pale pink, a beige, or cream color that will make your hands the portrait of perfection without drawing attention away from your eye-catching ring. If you want to go for something truly classy and elegant with your major new bling, consider a French tip style manicure. You can opt for the classic white or even include a line of silver or gold or pink to match the color of your ring’s band. If you have a more unique band, such as a rose gold setting, and want to complement your band perfectly, opt for a French tip manicure in that shade. Many engagement rings use gemstones nowadays, whether they opt for a colored stone as the centerpiece of a ring, or use a wide range of gems as side stones or to encrust the band. If you have sapphire, ruby, emerald, yellow diamond, or amethyst gemstones on your ring, you may choose to complement the more colorful aspects of your ring with your nails. It depends on what your style is but this could be as simple as choosing a shade of nail polish that matches your featured gemstones — so a blue mani for sapphires, red for rubies, and so on. French tips can be done in a multitude of colors now or feature a colorful strip, so you can choose to highlight your gemstones with a design of that nature. If you want to shake things up, consider matching the color of your gemstones, but opting for a matte polish — it’s more unusual and unique, just like the pop of color in your engagement ring. Nowadays, accent nails are quite popular. This is a single nail painted a different shade from your others, and it typically occurs on the ring finger. You could go for a more muted color on the majority of your nails and add some sparkly bling with gel polish or match your gemstones with the color of your accent nail — this may be a preferred choice if you’re hoping for a more trendy style. Whether actually vintage or vintage-inspired, engagement rings that hearken back to a different era are all the rage. If you have an Edwardian or art deco style engagement ring (or really any vintage look), consider a manicure that evokes the era. One very popular retro style is a reverse French tip that leaves a half-moon at the base of your nail-bed exposed while the top are painted in an eye-catching color (often red) — give that a try. A French tip with a more pointed design is also a popular retro style to consider. If you have an Art Deco ring, you could even opt for a Great Gatsby inspired Art Deco manicure in shades of black and gold. The two most popular days of the year for couples to get engaged are Christmas and Valentine’s Day. If the holiday is approaching and you think your special someone might be ready to pop the question, you may want to get a manicure so your nails are ready when the moment arrives. But you also don’t want to be seen as presumptuous or expecting it — so opt for a manicure that will look amazing with your ring, but also fits right in with the holiday. This could be something as simple as a Christmas red manicure or a perfect Valentine pink. If you want to get a little fancier, you could do holiday-centric designs, whether that’s Christmas or Valentine’s themed nail-art or maybe even an assortment of complementary colors like red and green for the holidays or pink, white, and red for Valentine’s Day. It’s very easy to do this in a classy, sparkly way — like painting your accent nail to look like a sparkly gift box or opting for a French tip with a sprig of holly. If you prefer something more understated, go with a wintry pale pink and a snowflake design. Make sure you’re celebrating both the holiday and your engagement with your nails. Deeper, richer colors are all the rage for fall, whether it’s a navy shade, a deep eggplant purple, a autumnal brown, a leaf-colored orange, or a rich burgundy. You could play up the fall leaves or the promise of apple cider with your design, but if you get engaged in the fall and want an eye-catching manicure, your best bet is a deep, warm color that is perfect for the autumn season. Think autumn leaves, red wine, fireplaces, and more — any color palette that fits in with that setting will be an ideal choice. There’s a deep shade suitable for fall in nearly any color imaginable, so choose your favorite. If you want to play up the more muted colors of fall, opt for a matte finish. If you want an extra bit of bling to complement your ring, opt for gold or brown sparkles to evoke the autumn leaves. Spring is a time of renewal, often known for the beautiful flowers in bloom. Put a pop of color in your manicure to reflect the season of your engagement, whether that be a sunny daffodil yellow or a playful lime green accent that reflects the first buds of springs. You can get really playful and opt for a manicure that showcases spring flowers in its design — if you’re showcasing your ring, you’ll probably want something more understated like a flower-dotted French tip or an image of soothing lavender. Springtime is all about flowers and the return of color, but is still focused on paler shades than the bright colors of summer. Summer is the best time to get loud with your nails — how else to pick them out from the sand on a beach? If you have a summer engagement, opt for the loud brightness of the season — hot pink, vivid orange, neon purple, and electric aquamarine. The warmth of the sun and the sand (or the pool) should be visible in your manicure. You can get that extra flash of bling in with a sparkly mermaid tale accent nail or a palm tree-inspired accent. Since summer is all about fun, you could even go for something super off-the-wall like flamingo or watermelon nails. 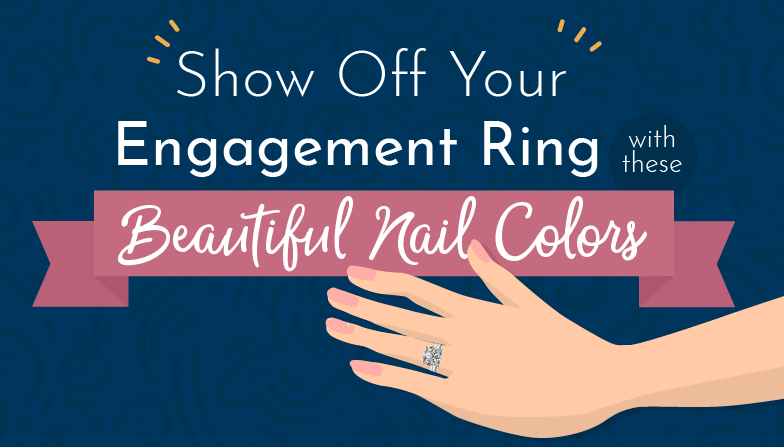 Have some summer fun, fun, fun with a bright splash of color in your engagement manicure. The sparkling clarity of your diamond will pop nicely against a vivid summer backdrop. Winter generally means one thing — snow and ice! So, opt for a wintry wonderland manicure if this is the season you get engaged during. Popular winter colors include silver, grey, pale blue, and periwinkle. You can also opt for richer jewel tones, particularly if it’s near the holidays. While summer nails are about bright, loud colors, winter nails are the exact opposite — a time for icily elegant designs and muted shades to match the weather. Get cozy with your nail design taking your color inspiration from knit blankets and heavy cable sweaters — think burgundy, navy, grey, and more. Or play up the snowy atmosphere with a snowflake accent nail. The best part is the silvers and greys will complement the sparkling brilliance of your engagement ring perfectly. Show off your beautiful ring all year with these great style tips! Don’t be afraid to mix and match, and if don’t like one style–you can always change it up.